Woolworths’ plastic bag ban will apply to the entire Woolworths Group network including Woolworths supermarkets, convenience stores and Big W. Its Dan Murphy’s and Cellarmasters alcohol stores are already plastic bag free. Brad Banducci, Chief Executive Officer of the Woolworths Group, said Woolworths felt it needed to take a stance on this issue. 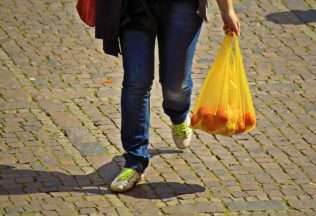 “We currently give out more than 3.2 billion lightweight plastic bags a year and hence can play a significant role in reducing overall plastic bag usage,” Banducci said. “Whilst we know this is a major decision, we will work very closely with all of our store teams to ensure the transition for our customers is as simple as possible,” he said. Woolworths further stated that it will also be working to reduce plastic use across its entire supply chain, especially with regard to fruit and vegetables. Customers will have access to alternatives to the plastic bag, including being able to purchase thicker re-useable plastic bags. Big W may provide these bags at no extra-cost. Coles Chief Customer Officer, Simon McDowell, said Coles has been working on removing plastic bags for some time. “We know customers like the convenience of single-use bags, so we’ll make sure we have plenty of other options for them if they forget to bring their own bags from home,” he said. Coles said it would also continue to offer soft plastic recycling services at 630 of its stores. Harris Farm Markets has decided to ban single use plastic bags following its ‘Ban The Bag’ campaign launched in April 2017 where it donated 5 cents to Clean Up Australia every time customers said no to plastic bags at the checkout. Co-CEO’s of Harris Farm Markets, Angus, Luke and Tristan Harris, said they congratulated Coles and Woolworths for also deciding to stop offering single-use plastic bags. “For at least 10 years we have offered our customers the choice of cardboard fruit boxes as an alternative to plastic bags. From 1 January 2018, we will also offer a range of free small single-use paper bags and reusable paper bags sold at cheaper than 15 cents or cost price,” they said. “We will continue to work towards an outright ban on single-use plastic bags. We believe the NSW Government needs to enact a full ban to avoid us facing a frightening future where we pollute and destroy our marine wildlife,” they said. South Australia, the Northern Territory and the Australian Capital Territory already ban single-use plastic bags. Queensland will be banning the bags in 2018. New South Wales, Victoria and Western Australia are yet to introduce such legislation.